So apparently Kanye is buying Kris Jenner all of these presents to get in good with the K Fam. Ugh, they’re so vile-ly materialistic and all so perfect for each other. If Kris keeps pretending she doesn’t like Kanye it could be quite lucrative for her. He recently bought her a $200,000 Bentley with her initials sewn into the upholstery and a Swarovski Crystal gear knob. ”He’s been bombarding her with gifts like vintage bottles of wine, bouquets of flowers, jewelry and now the expensive car,” said one of those Sources people. Hope he’s not buying fraudulent vintage wine bottles from accused counterfeiter Rudy Kurniawan (read the story in Vanity Fair) or the ones Hardy Rodenstock sheistered everyone with (as told in the fascinating The Billionaire’s Vinegar which I just finished, and recently rumored that it was being made into a movie starring Brad Pitt – I mean, who knows). All of this vintage wine buying is risky business and a major problem in auction land, so Kanye needs to be kareful. Anyway, which gift would you most be wooed by if you were the leader of the K’s? 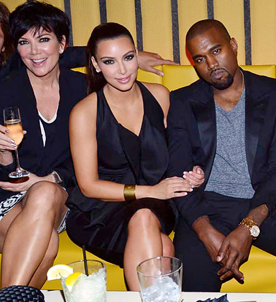 Tags: kanye west, kim kardashian, kris jenner, vintage wine. Bookmark the permalink.